Hyundai made a name for itself in the US in the late 80's when it began selling cheap, poor-quality, compact cars. Now the Korean conglomerate is trying to get a foothold in the US market selling LCD TVs from its electronics division. Our experience with the HQL320WR tells us that the company isn't making the same mistakes it did with its early cars. 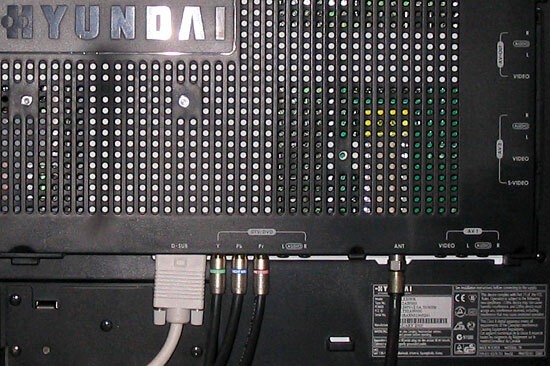 The Hyundai HQL320WR LCD television is an average-performing, cost-effective TV. For users wanting a simple LCD flat panel TV at rock bottom cost this 32-inch LCD is a top contender. The HQL320WR is simple in its design. A black frame surrounds the screen. Black speakers are built in on both sides and a smoke-silver strip outlines the entire TV. There's a lot of frame for a 32-inch TV, so much so that I think the frame makes the screen look smaller than it actually is. It is not an especially aesthetically pleasing LCD. The television, which is fairly light for its size at 40 lbs, sits on top of a tilt-and-swivel stand for easy positioning. BUYER BEWARE: Hyundai Electronics' limited presence in the USA gives us cause for pause. Visiting the company's website, https://www.hea.com/, we received the error message "No web site is configured at this address.” We didn't get an answer when we tried Hyundai's technical support number and when we called the company's 800 number we got a generic message saying Hyundai's mailbox was full. If our experience is any indication getting support for this product could be difficult. If you buy this TV make sure your purchase it from dealer that is reputable and has an excellent policy for supporting customers – otherwise your big savings could be a big bust. This also makes one wonder about the manufacturers warranty. Will the LCD get serviced under warranty? Will there be parts in the U.S. to service it? Color performance on this LCD is excellent, but black levels and dark scene detail is lacking. Picture adjustments take place on a 0 to 100 scale in units of 3 and 2. Out of box picture is color rendition is very accurate. Hyundai didn't play the showroom trick of making ridiculously false hues for the default setting so its TVs will catch your eye on the display floor. Shortly after getting the TV out of the box we were able to enjoy a documentary on butterflies. The HQL320WR conveyed shimmering color on the butterflies' wings with ease. We knew the breathtaking color wasn't an exaggeration on the part of the Hyundai because the surrounding leaves and bark were conveyed with natural hues, just like you'd find them in your garden. The HQL320WR LCD's picture color never let us down. Color accuracy persisted throughout our testing as we watched content from DVD, VHS, and HDTV sources. While color performance on this LCD was very good, black levels and dark matter detailing were a problem. After our butterfly documentary, we watched Galaxy Quest at HDTV resolution. We had to crank up the contrast to 60 and the brightness to 57 to see details in a dark spaceship. Hyundai reports the contrast ratio at suspect 1,000:1, while we measure it at a more realistic 410:1. Dark matter detailing suffered throughout all sources. In many cases, a dark scene just transforms to black, making definition in a dark coat for instance all just a mush of black. Even though darks weren't good, we could see that with a 1080i feed the Hyundai did an excellent job handling HDTV. The subtleties in color and texture of both human skin and alien flesh in Galaxy Quest were clearly visible on the 1366 x 768 screen. The built-in NTSC tuner did not begin to do justice to local digital broadcasts. You'll definitely want to use an HDTV cable, satellite, or broadcast tuner if you want to take full advantage of the TV's resolution. Watching TV on the NTSC tuner gave us a chance to test the HQL320WR's scaling ability. The 4:3 aspect ratio setting boxes an unmodified 4:3 source in black. 5 zoom settings scale the image up, progressively chopping more off of the top of the image. The 5 settings mean you'll probably be able to find a good setting for movies with different size letterboxes. The 16:9 setting uniformly stretches a 4:3 image to fill the screen. Panorama performs a similar, full-screen stretch but applies aspect ratio correction to the center part of the screen to minimize visual distortion. Unfortunately during pans this variable aspect correction is somewhat nauseating as people, trees, and buildings become wider, then thinner, then wider again as they move across your screen. If you have a weak stomach don't use this setting in your kitchen. Watching The Motorcycle Diaries in wide screen was a pure joy. Bright scenes from Enernesto ‘Che' Guevara's travels across South America were displayed in awe-inspiring color and with great clarity from our DVD player's progressive scan output. From the peaks of the Andean mountaintops to the bottom of the Amazon basin, the Hyundai HQL320WR rendered outdoor scenes with real-life accuracy. We tested the built in 3D comb filter by switching from 480p and 480i. Only when resuming from a pause or a freeze frame could we see any artifacts in motion scenes. During normal playback the built-in 3:2 pulldown filter did its job as well as our Hyundai DVD player did. We presume Hyundai isn't embellishing when it reports a response time of 23ms, a rating approximately twice what can be expected from a first-tier Sharp or Hyundai. This will obviously cause some motion lag during fast moving scenes as was evident when watching a NASCAR special via cable. If you use this TV mostly for fast-action movies or video games you may want to consider an LCD option with a faster response rate time. This problem can cause considerable eye strain and annoyance over time. It's a shortcoming of LCD overall, but varies quite a lot depending upon the quality of the LCD panel itself. Horizontal and vertical viewing angles were excellent. Through 160 degrees most color information was visible and even through to 170 degrees plus we could see a picture. The natural Anti-glare effect of LCD televisions twisting crystal technology curbed any interference from in-room light sources. When all is said and done, our only gripes with this LCD's picture are its not-so-black blacks, washed-out dark scenes, and lagging motion response times. As professionals who look at TVs every day we really enjoy a TV that is easy to take out of the box and get up and running. Not to be immodest, but if we can't figure out how to get a picture to display on the screen in less than a 30 seconds after inputs are connected it's a good indication the average consumer is going to spend at minimum 15 minutes in frustration. Everything worked out of the box, as expected, with the refinement we'd expect of a brand like Hyundai. While Hyundai's interface wasn't as aesthetically appealing as the top-brand's, the interface was logical and easy to use. The remote control was easy on the hand and easy on the eyes. On-screen menus were a breeze to navigate. Thoughtful input buttons on the remote control eased the task of choosing from the TV's inputs. The HQL320WR includes one each of component, VGA, and coaxial inputs. There are three composite inputs, two supporting S-Video, and one side-mounted. There's no pure-digital connection such as HDMI or DVI, nor is there a built-in cable card slot. Taking advantage of two HDTV sources will require some sort of external selector or switching. This won't be an issue for consumers until an HD-DVD standard is established; if you're looking to go bottom dollar with this TV, you probably won't be an early adopter of pricey HD-DVD technology. Adjusting sound properties was the single non-intuitive task we performed on this television. SRS, equalizer, and stereo/mono settings are split between three remote buttons and two menus. Once you've mastered the controls there's no problem getting decent sound out of the TV's built-in speakers. Hyundai doesn't provide a wattage spec for the speakers, but for viewing the HQL320WR LCD TV inside of 12 feet they are fine. Those seeking room-shaking bass will want to hook up a home theater system using the RCA audio-out jacks. There is no digital audio out. The TV's picture-in-picture can be placed in 5 locations on the screen in 5 sizes. PIP-controls were straightforward and easy to use. We tested the HQL320WR with our laptop and were pleased with the results. The video card immediately recognized the display's ability to support 5 resolutions from 640x480 up to 1024 x 768. Our favorite setting, and a pleasant surprise, was the 1024 x 576 resolution (not a standard computer or TV resolution). HDTV LCD TV pixels are flatter than an LCD computer screen's and sometimes images appear flattened at 1024x768. We were impressed with the Hyundai's ability to scale the 1024x576 source onto its 1366x768 panel with minimal distortion and blurring. 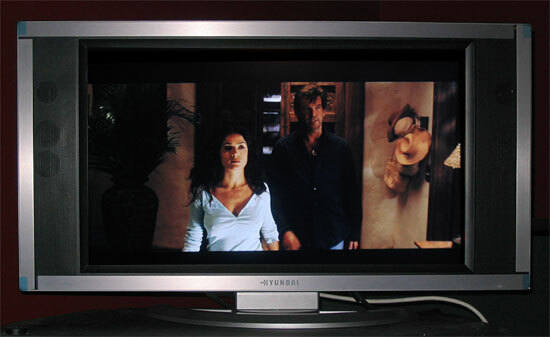 The result was an aspect-ratio-correct computer desktop rarely found on an inexpensive HDTV LCD. The TV comes attached to a tilt-and-swivel base, a nicety especially for those using the TV with a computer input. The TV weighs about 40 lbs and, with the stand attached, is approximately 22 inches tall, 38 inches wide, and 9 inches deep. Average power consumption is listed at 140 watts and peak consumption is probably around 300 watts. The TV gets hotter than some of the competition but is far from the hottest LCDs we've seen. It is as quiet as the competition and electronics are not audible at viewing distance. How is it that they restrict placing water bowls on the TV but not salad bowls? Rating scale from 70 (denoting poorest quality) to 100 (signifying the very best quality). A rating in the 60s for any particular category of a product review indicates a serious defect which causes the product not to operate properly. Picture quality is double-weighted in the Overall Rating Score calculation. Buy Your Extended Warranty from Us.